On Sunday August 30th I completed the Bridge to Brisbane 10 km fun run! 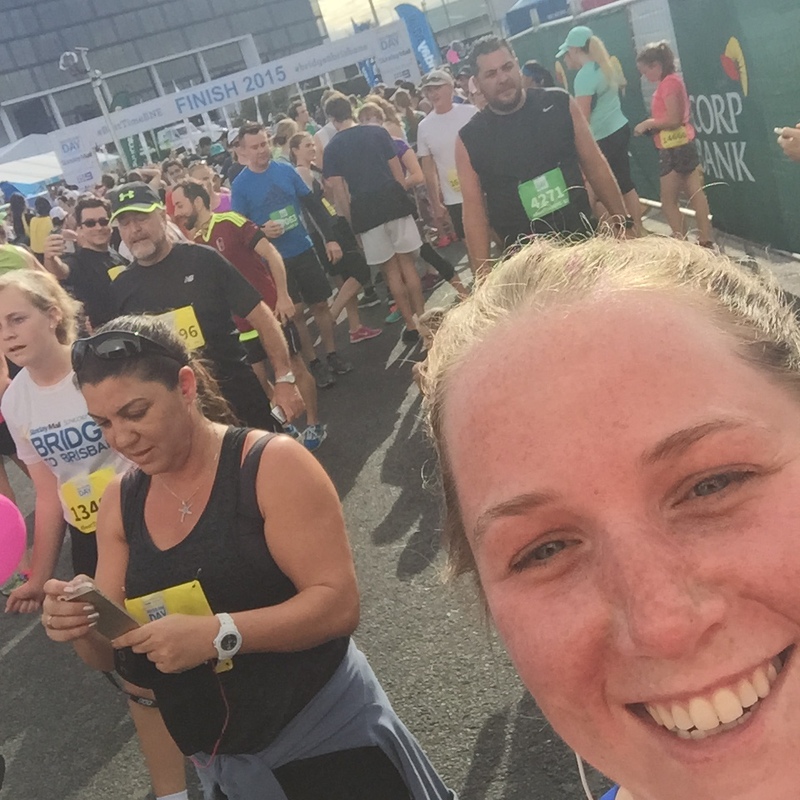 This is Brisbane’s largest annual fun run and was my first 10 km fun run – I usually go along to a few 5 km ones such as the Neon Run. Every year the run falls on a week where we get a sudden heat wave and this year was no different. It was between 30 and 35 degrees all week long. We were also forecast a storm for Sunday morning and the ominous heavy rain and grey skies on Saturday didn’t fill me with confidence. However, Sunday morning dawned (yes it was a super early start) and it was dry but overcast – hooray for cloud cover! Mark was also running with his workmates and we were both signed up for the jogging category so headed over together, bleary eyed and a bit nervous. The run starts on the southern side of the Gateway Bridge, which is really very steep for a bridge! The first kilometer is a solid uphill grind. You’ve walked about 2 km by the time you get to the start time so you’re pretty well warmed up though. Coming down the other side of the bridge was certainly more fun than going up it! Unfortunately about 3.6 km my left knee went out (it has a nasty habit of doing this). I then walked for about a kilometer, which really slowed me down. After that I got my jog on again though and slogged away pretty well. The route follows Coronation Drive, which runs along the Brisbane River and has great views of the CBD. If you’re ever arriving in Brisbane for the first time, I would really advise you to take the route into town via Coro Drive rather than via the tunnel, it’s nice day or night. There were some great supporters out cheering for people and a few bands to motivate people along the way. There were also a load of Vegan protesters too, which seemed slightly odd… and made me want a bacon sandwich! It was pretty cool running along the Inner City Bypass, which is usually only open to vehicles, as you get cool views coming into town. Although the uphill incline around the 6.6 km mark wasn’t going down well with anyone! At 8.2 km I saw my first person vomiting, which made me feel infinitely better about how I was doing and all my sore bits! The run finishes up at the Brisbane RNA Showgrounds, where you get given a t-shirt and refreshments. I chowed down on some oranges and went to find the rather speedier-than-me-with-his-giant-person-legs Mark. It took me 1 hour and 18 minutes to complete, which was under my self-imposed cut-off of 1 hour and 20 minutes… just. But I’m happy with that! Originally I had hoped to get in a few months of training and get in around the 1 hour and 5 minute mark; however, I hadn’t been out for a jog in over 6 weeks by the time it came round, so all in all a pretty decent attempt. This entry was posted in 30@30 and tagged 10km, 30@30, 30at30, B2B, run. Bookmark the permalink.